The dive site Glencairn Barge or Cement Barge is an offshore recent wreck on a rocky reef in the Glencairn area on the False Bay coast of the Cape Peninsula near Cape Town in the Western Cape province of South Africa. The name "Cement Barge" is derived from the wreck of a small barge at this site, said to have been used to transport cement, but more probably used to convey rock from the quarry to Simon's Town. 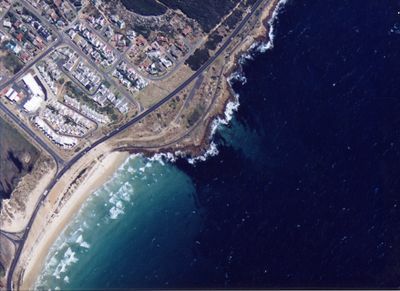 The alternative name "Glencairn Barge" refers to the suburb Glencairn, off which it lies. Maximum depth is about 14m and the top of the wreckage is about 12m. Low sandstone reef with sandy patches. The wreck lies on the edge of the sand. Geology: Sandstone reef probably of the Peninsula formation or possibly the underlying Graafwater formation. Best dived in a low swell. This is more important for shore entries, when an onshore wind will make entry and exit tricky, and an offshore wind could make the trip back very tiring if done on the surface. The site is usually at it's best in winter but there are also occasional opportunities in other seasons. Paved off-road parking at the whale lookout is usually adequate. Boat dive or shore dive with a long swim. Access and entry/exit for shore dive as for Quarry. Boat dive from Simon’s Town or Miller’s Point slipway. Reef life is predominantly feather stars and sea cucumbers, with significant presence of large sea squirts. A moderate range of fish may be seen, largely cryptic species, like Klipfish and Redfingers. Small wreck of a steel barge. The hull is intact and lies upright on a sandy patch between the reefs. Two holds are open to access from above and the overhead around the sides is trivial. Boat dive: Put down a shot-line or anchor at the wreck There are few useful landmarks on the reefs, so it is easy to lose the wreck if you move away from it, so a live-boat dive is convenient for the divers. Entry and exit may be difficult in an onshore wind, and the return swim could be tiring in an offshore wind. This area may be on the summer cruise route of the local Great White shark population, but this is hypothetical at this stage. No special skills required on boat dives. Good fitness and ability to navigate with a compass are required for shore dives. A compass is essential for shore dives to navigate back under water. A deployable SMB is convenient when doing a boat dive. On night dives a light on the shot line will help divers find their way back if they move away from the wreck and can’t find it again. This page was last edited on 3 November 2017, at 13:56.